The Humble Mobile sub-category of the Humble Bundle offerings contains strictly Android games, so there no Steam keys to go along with the titles found in the fourth iteration of this bundle, but nevertheless you can't go wrong when you name your own price. This time around you'll be able to get Catan, Vector, Riptide GP2, and Zombie Gunship for however much you wish to pay. 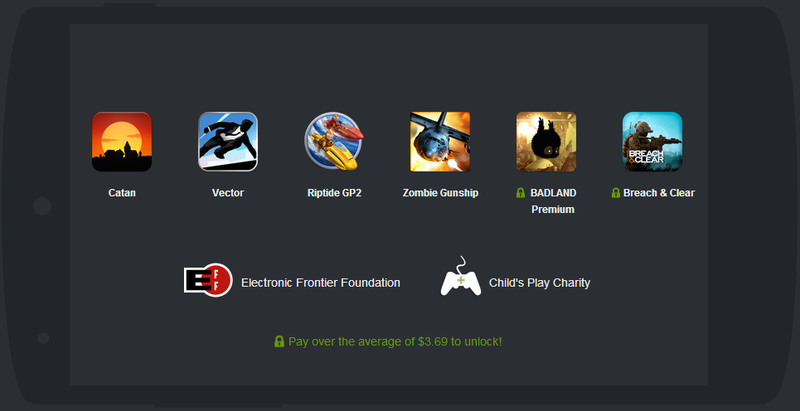 Beat the average and BADLAND Premium as well as Breach & Clear will also be thrown into the pot. As always, your purchase can be split however you wish among developers, Humble Bundle, and the EFF and Child's Play charities, and we can expect additional games to be revealed for those who beat the average as the bundle draws nearer to a close. As it stands, there are 10 days and 15 hours remaining.